Apple, Orange, the Blackberry: the world of consumer technology loves a bit of fruit. Using the name of clean and fresh natural produce, these corporate giants are hoping for a little piece of nature’s reflected glory. Some fruit, I assume, is off limits. Nobody with any sanity is going to condemn their product from the off by naming it after a farting sound or laying it open to accusations that things have gone pear-shaped. But I expect that in some silicon valley, plans for the Strawberry and the Cherry are well advanced. I am not sure where the gooseberry – or “goosegogs” as my Dad called them - would fit into all this but its slang definition as an unwanted third party could damn any product as surplus to requirements; the one that takes a back seat when the Microsoft Peach and the Sony Ericsson Pineapple are getting together; hanging around when it’s not wanted. 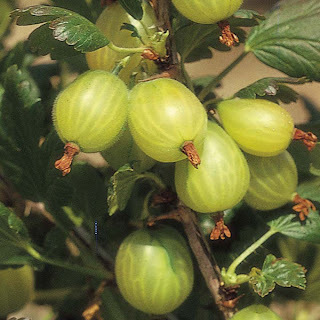 At the moment, however, the gooseberry is anything but unwanted. After a windy, soggy spring that seems to be turning into an equally damp and squally summer, I have hardly any produce to show for my labours in the veg patch and allotment. There has been the rhubarb and the usual crop for the salad bowl but this has been greatly diminished by stunted lettuce, rocket and spinach leaves and diminutive radishes. This time last year we had already been cooking with our own broad beans, peas and courgettes. This year, the winds have battered these plants and the lack of sunshine has prevented them from coming on; which is why I am grateful to the gooseberry. Seemingly unnoticed, my gooseberry bushes – which I only planted last autumn - suddenly appeared to be heaving with fruit. They have timed it perfectly to take the place of the rhubarb in the Sunday crumble and their sour taste, offset by the sugar, has been delicious – the kids loved it. The reason why gooseberries have done so well this year is simple: they do well every year but I just haven’t noticed. The gooseberry bush is indigenous to the cool northern European climate and they will thrive in pretty much any conditions in this country. When I was a child, I remember that my Dad used to grow them in the shade of the apple tree – proof that they can thrive with little or no direct sunlight. I also remember that any fruit that were still on the bush by the time the summer holidays started were not sour but deliciously sweet to eat raw. All I hope is that I can keep the birds away from them long enough for my kids to share the honeyed taste of goosegogs straight from the bush.